DEEP beneath the plains of Illinois, in a man-made cavern filled with racks of scientific equipment, someone has spray-painted a white circle onto the bare rock wall. Stand in front of it and you are standing in the path of the most powerful beam of neutrinos in the world, which is emerging from a nearby particle accelerator at Fermilab, America’s main particle-physics laboratory. With any other kind of accelerator, standing in the beam would have spectacular and fatal consequences. But your correspondent was not vapourised—nor, several weeks later, has he developed either cancer or superpowers. The T2K experiment in Japan measures the appearance of electron neutrinos in a beam of muon neutrinos. A pure beam of muon neutrinos is sent from a source in Tokai to a detector 295 km away in Kamioka. Charge-parity (CP) violation—evidence that the laws of physics are different for particles and antiparticles—is often invoked as a “must” to explain why we observe more matter than antimatter in the universe. But the CP violation observed in interactions involving quarks is insufficient to explain this asymmetry. As a result, many theorists are looking toward leptons—and, specifically, neutrinos—for additional sources of CP violation. 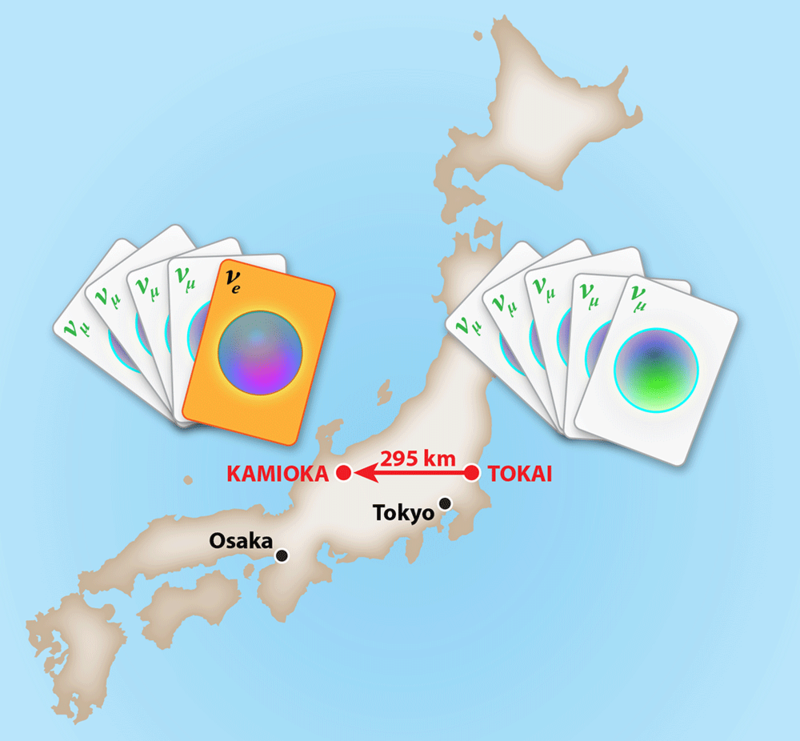 Researchers running the Tokai to Kamioka (T2K) experiment—a particle physics experiment at the Japan Proton Accelerator Research Complex (J-PARC)—have now made an important contribution toward the search for CP violation in neutrinos. Writing in Physical Review Letters, the T2K collaboration reports the strongest evidence to date for the appearance of electron neutrinos from a pure muon neutrino beam . Their measurement allows them to determine a fundamental parameter of the standard model of particle physics, called θ13, which can in turn be used to make an early estimate of CP violation in neutrinos. Although this estimate has a large uncertainty, it will serve as a guide to future, more definitive neutrino experiments that are directly sensitive to CP violation. The second half of the T2K experiment, the Super-Kamiokande (SK) detector, is located roughly 300km away, deep within the Kamioka mine. This immense 50 kiloton water Cherenkov detector was once used (and still is) to measure neutrino oscillations from the atmosphere—one of the first experiments to confirm that neutrinos could oscillate between flavor states, and hence possessed a finite mass  (see 1 September 1998 Focus). In its new role, the SK detector functions as the primary target for the Tokai neutrino beam. Instrumented with over 11,129photomultiplier tubes, SK detects the faint Cherenkov light created by high-speed charged particles, which are produced when neutrinos interact with water molecules. The results from T2K contribute to a steady march toward a full understanding of neutrino oscillations. At face value, the measurement provides a complementary verification of the value of θ13 to that measured by reactor neutrino experiments  (see 23 April 2012 Viewpoint). In addition, T2K combines their measurement of θ13 with that measured from disappearance experiments and feeds its value into the equation describing muon neutrino to electron neutrino oscillations. This allows them to solve for possible values of the CP violation phase. T2K’s preliminary analysis of the phase, which can vary between -π and π, seems to disfavor certain nonzero values. (The precise excluded values depend on what they assume about the neutrino mass state hierarchy.) The uncertainty of the excluded values is, however, still too large to make a definitive statement about CP violation in neutrinos. K. Abe et al. ((T2K Collaboration)), “Observation of Electron Neutrino Appearance in a Muon Neutrino Beam,” Phys. Rev. Lett. 112, 061802 (2014). Y. Fukuda and et al. (Super-Kamiokande Collaboration), “Evidence for Oscillation of Atmospheric Neutrinos,” Phys. Rev. Lett. 81, 1562 (1998). K. Abe and et al. (T2K Collaboration), “Evidence of Electron Neutrino Appearance in a Muon Neutrino Beam,” Phys. Rev. D 88, 032002 (2013). P. Adamson and et al. (MINOS Collaboration), “Electron Neutrino and Antineutrino Appearance in the Full MINOS Data Sample,” Phys. Rev. Lett. 110, 171801 (2013). F. P. An et al., “Observation of Electron-Antineutrino Disappearance at Daya Bay,” Phys. Rev. Lett. 108, 171803 (2012). The first deep space neutrinos to be detected since the 1980s may be the spawn of mystery dark matter. That would explain puzzling features of these particles – and suggest an unusual identity for dark matter. Neutrinos, ghostly subatomic particles, are routinely produced by the sun and on Earth, but apart from those seen after a 1987 supernova explosion, none had been detected from beyond the solar system. 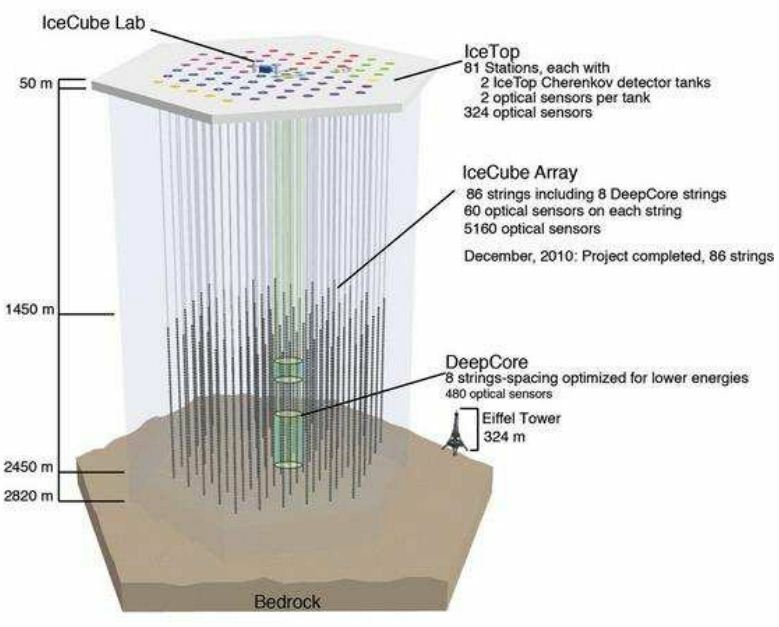 Then, earlier this year, the IceCube collaboration, which monitors a cubic kilometre of ice at the South PoleMovie Camera, reported two deep-space neutrinos, dubbed Bert and Ernie, each with a mass of about 1 petaelectronvolt (1015 electronvolts). These were quickly followed by reports of a bunch more, with masses of tens of teraelectronvolts (1012 eV), mass and energy being equivalent for particles. Deep-space neutrinos are prized because they could allow “neutrino astronomy” – using neutrinos to investigate mysterious cosmic objects. 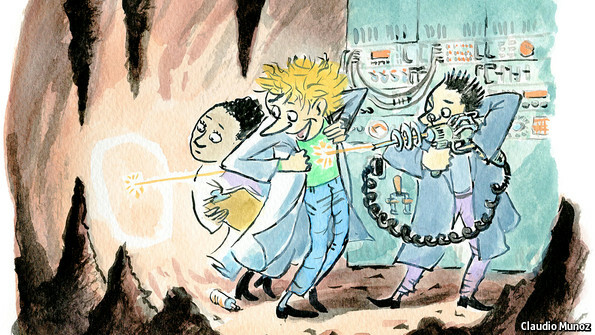 Being chargeless, neutrinos zip from a source direct to Earth without being waylaid. However, expected sources of such neutrinos, including energetic explosions called gamma-ray bursts or emissions from supermassive black holes called active galactic nuclei, should also produce neutrinos of energies different from those seen by IceCube so far. Pasquale Serpico of the University of Savoy in Annecy-le-Vieux, France, and colleagues wondered if the lack of these other energies could be a sign of decaying dark matter – the invisible stuff thought to make up about 80 per cent of the universe’s matter. They calculate that heavyweight dark matter particles of about 1 PeV would decay either directly into neutrinos of about 1 PeV, or into other particles and then into neutrinos with energies of tens of TeV. “It exactly reproduces the features that you see in IceCube,” says Serpico. This comes hot on the heels of recent reports from several dark matter detectors, which have seen signs of much lighter particles, with masses of about 10 gigaelectronvolts. Tom Weiler of Vanderbilt University in Nashville, Tennessee, says there is no theoretical reason why dark matter shouldn’t be heavy. The production of such particles would require more complicated mechanisms in the early universe, so theorists tend to prefer lighter particle candidates. “But Nature is the arbiter, not theorists,” says Weiler. Or the mysterious stuff might come in flavours – both light and heavy. “In general, the physics community prefers to have a single dominant dark matter [type], but it doesn’t have to be so,” says Serpico. Francis Halzen, of the University of Wisconsin-Madison, and the principal investigator of the IceCube collaboration, isn’t convinced by the new theory. The neutrinos seen by IceCube can still be explained by standard sources if the gap in neutrino energies goes away as the experiment collects more particles. “I do not think that anything in the data requires a more exotic explanation at this point,” he says. Whether the neutrinos come from dark matter will become clearer as IceCube amasses more neutrinos and the gaps in energies either persist or vanish. “If the hypothesis is correct, the birth of neutrino astronomy coincides with the discovery of dark matter,” says Weiler.